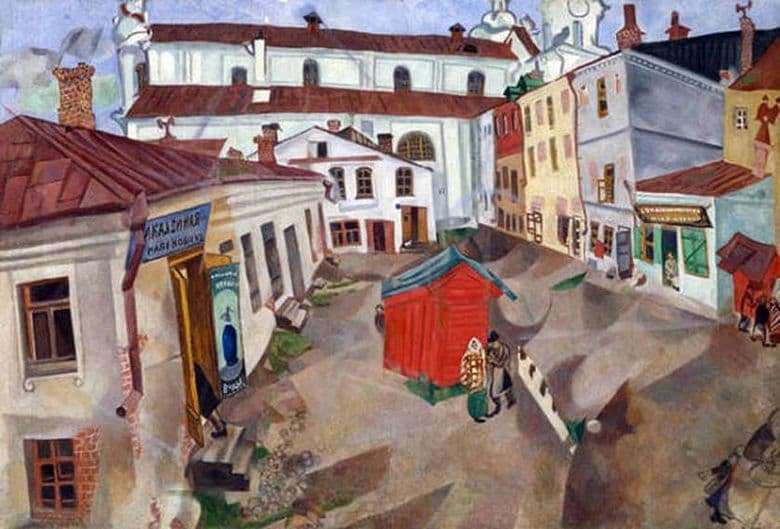 The painting “Vitebsk, Market Square” was painted by the artist M. Chagall in 1917. The painter decided to devote the creation to his beloved city and painted on canvas his largest market square with bright signs luring passersby and uneven buildings. The author of the picture used bright colors and his own unique style, writing out every element of the everyday scene, which everyone can witness. There are very few people on the market square, on the left you can see the foot of a customer who has entered a certain institution, on the right – two buyers interested in the product. In some places, the sellers are visible, but they are depicted a little blurred, which makes them a full part of the picture, like shopping malls in the area and they are a single whole. In the center of the composition are a man and a woman. They are standing near a bright red shopping tent with a contrasting blue roof and are discussing something. Perhaps the topic of their conversation was the product, which should lower the price in order to quickly sell. Both people and houses look a bit scruffy. No one of the buyers and sellers has expensive clothes. The buildings are old and dilapidated, except for a few large houses in the background. Chagall did the work in an abstract style, making all its elements flat and the shadows very clear. They stand out, look unnatural and mysterious, despite a clear sunny day. The same goes for the gray smoke coming out of the stone pipe. The whole picture looks like a fascinating appliqué, under which lies more than just an image of the market square.